If you’ve decided that a formal sit down dinner is a bit too stuffy and you just want your guests to be able to mingle and enjoy themselves, cocktail food could be the perfect alternative to a three course dinner. Here are our top tips on wedding cocktail food. Do the shapes, materials, and colours of the serving platters match your theme? Consider the colours of your cocktail dishes; are they attractive, do they work together, and do they work with your wedding colour scheme? Could you come up with something more appealing that would be better suited for your wedding? How your wedding cocktail food looks is almost as important as how it tastes, and presentation is the vital to creating a great impression. If you have chosen a very spicy flavour to your cocktail food, try to include something a bit more subtle but equally delicious for those guests that can’t tolerate hot food. Make sure you have some vegetarian dishes, and if possible a dairy free and gluten free option. 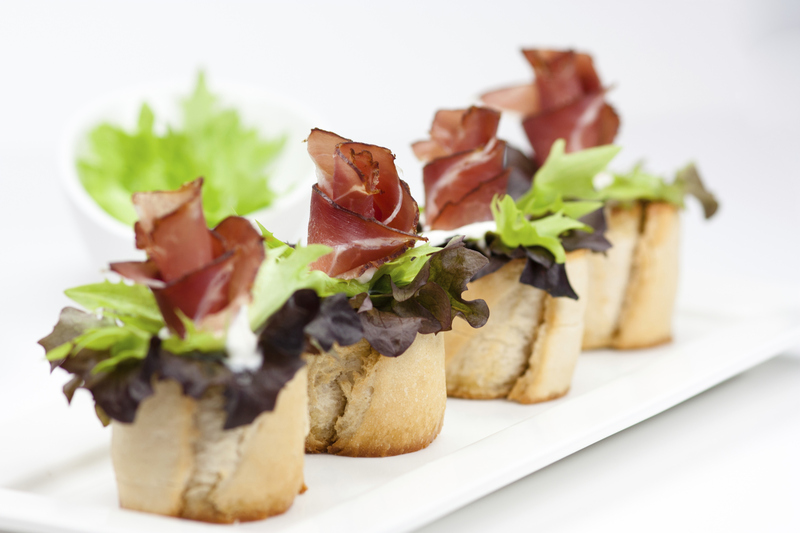 Offering a wide range of dishes is a good way to make sure every guest can pick out something that they like. Choose foods that are easy to pick up and eat with the fingers, and stick to bite sized portions to avoid a lot of crumbs or dropped food. If you want to serve something with a sauce, offer Chinese spoons or another type of small bowl with a matching fork or spoon. Your guests have almost certainly invested a bit of time and money getting dressed for your wedding, so you don’t want them to be splattered in tomato sauce half way through the cocktail hour. Freshly cooked French fries are a great example of simple wedding cocktail food. Present them in shot glasses with a dash of sauce at the base, or in tiny newspaper cones resting in ice cream cone holders. When you start looking at cocktail food menus you will see a variety of foods you may never consider consuming in any other situation. Sea food tends to appear quite prominently along with exotic sauces and spices. Bear in mind, your cocktail food can be simple items that you know all your guests will appreciate. Wedding cocktail food should preferably be a mixture of both hot and cold dishes unless your wedding is in mid-summer when you can just serve cold. 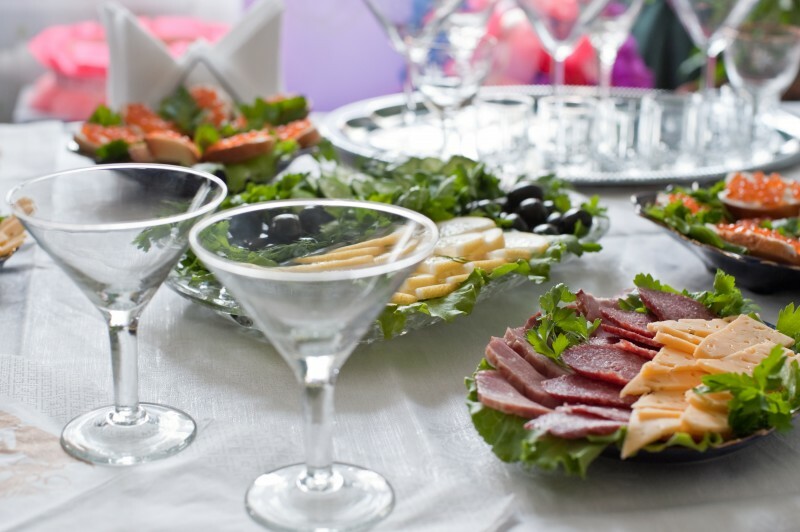 Have large platters of cold cocktail food spread out within the reception venue, and then just have hot food prepared and served by waiters during the course of the party. Cold food is easier to serve, but hot food is more satisfying and filling. First select your drinks and then use that as the starting point for your food. If you are serving a signature cocktail, you should also be able to get some advice on the types of wedding cocktail food that would be best suited to it from your bartender. The concept of cocktail food is that it accompanies the cocktails or other drinks that your guests are drinking, rather than overpowering them. Some tasty cocktail food dishes that won’t stretch your budget include shot glasses of hot or chilled soup, miniature hot dogs, or tiny tubs of popcorn. Individual cocktail dishes may not seem too expensive on their own, but it’s easy to get carried away and for the costs to escalate so it ends up being more expensive than a sit down dinner.